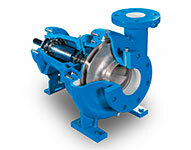 Centrifugal pumps basically consist of a stationary pump casing and an impeller mounted on a rotating shaft. The pump casing provides a pressure boundary for the pump and contains channels to properly direct the suction and discharge flow. The pump casing has suction and discharge penetrations for the main flow path of the pump and normally has small drain and vent fittings to remove gases trapped in the pump casing or to drain the pump casing for maintenance. If you’d like to receive a quote, or just get more information contact us at (844) 800-PUMP! Please Call 6X4X10 1 Flanged 6.0 4.0 Stainless Steel MTL: STAINLESS STEEL, IMPELLER: 10.75"
ITT Allis Chambers 100 6X6X13L 1 Flanged 6.0 6.0 MODEL: 100, TYPE: 2000, SIZE: 6X6X13L, IMPELLER: 11.90"
ITT Allis Chambers Type 2000 Model 150 8X6X9.5 1 Flanged 8.0 6.0 PACKAGED W/ 30HP MOTOR @ 1765 RPM, 230/460V, 3PH, 60HZ, 286T FRAME. ITT Allis Chambers 391 8X6X11 1 Flanged 6.0 6.0 MODEL: 2000-391, TYPE: 2000, SIZE: 8X6X11, IMPELLER: 11"
Ampco 2.5X2 ZC2 3 Flanged 2.5 2.0 Stainless Steel PACKAGED W/ 10HP MOTOR @ 3500 RPM, IMP: 6.25"
Ampco 3X2-1/2 ZCH2 1 Flanged 3.0 2.5 STAINLESS STEEL WITH 15HP MOTOR AT 3500 RPM, IMP: 6.5"
Ampco 3x2.5 ZCH2 1 Flanged 3.0 2.5 Stainless Steel PACKAGED W/ 15HP MOTOR @ 3500 RPM, IMP: 6.50"
Ampco 4X3ZC2 1 Flanged 4.0 3.0 PACKAGED W/ 10HP MOTOR @ 3500 RPM, 208-230/460V, 26-24/12AMP, 3PH, 60HZ, 215JM FRAME, IMPELLER: 5.25"
CRANE 6G1AP-J2J2 1 Flanged 8.0 6.0 IMPELLER: 11"
Goulds 3657 2X3-7 1 Flanged 3.5 2.0 INDEX: 4SSLL500 L94, SIZE: 2X3-7, IMPELLER: 5.75"
Gusher GK-2X2-5-10SES-C-4-CP 1 Flanged 2.5 2.0 IMPELLER: 7.5"
Iwaki 400CV6-D 1 Threaded IMPELLER: 3.35"